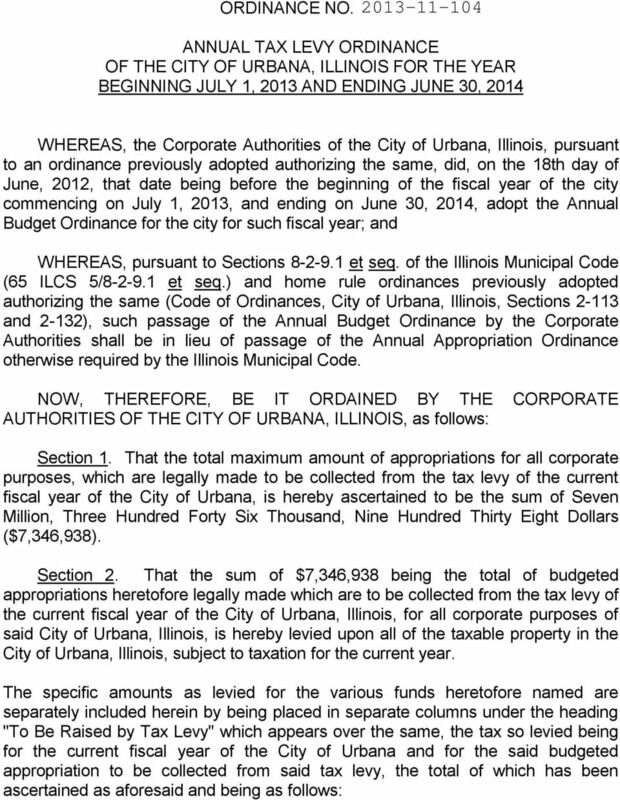 Download "M E M O R A N D U M. Mayor Prussing and Members of the Urbana City Council"
1 M E M O R A N D U M TO: Mayor Prussing and Members of the Urbana City Council FROM: Interim Comptroller RE: Property Tax Levy DATE: November 7, 2013 Attached for your consideration is the 2013 property tax levy ordinance for the City of Urbana. This ordinance must be filed with the County Clerk no later than the last Tuesday in December. Thus, this will be on the City Council agenda for approval November 18th. 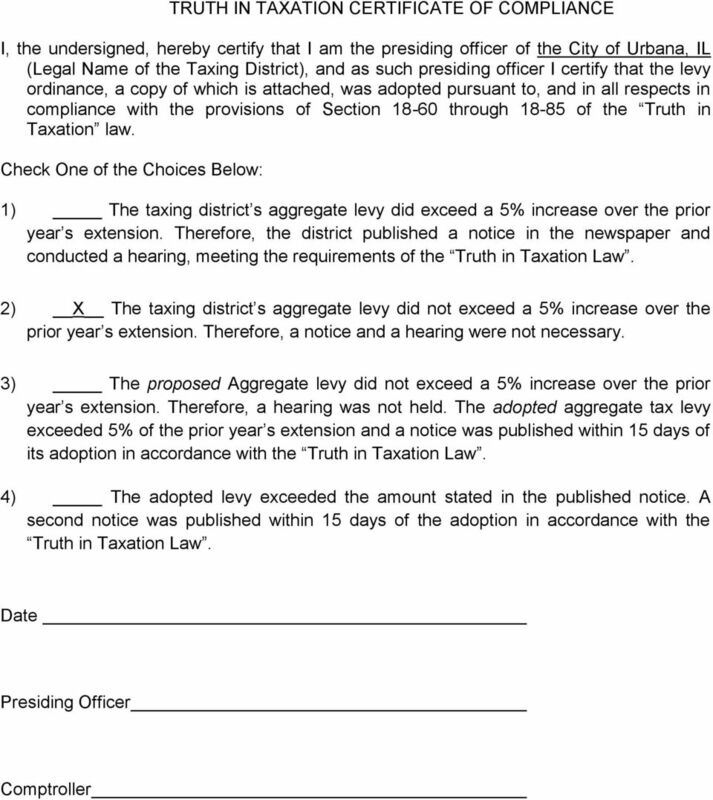 The attached levy ordinance has been prepared in order to levy the amount approved in the FY budget. As there are three factors that affect the total levy, (i.e., assessed value, tax rate and total levy) only the tax rate or the levy amount can be determined in advance by the taxing district, not the final assessed value to be taxed. Thus this resolution is written to establish the levy amount in advance in order to maintain the ability to levy up to that amount once the total assessed value is determined. As in 2012 once the final assessed value is known the city may then pass a subsequent resolution in order to establish the levy based on a certain rate. This must be done and filed with the County Clerk prior to the levy being extended by the County Clerk in April. 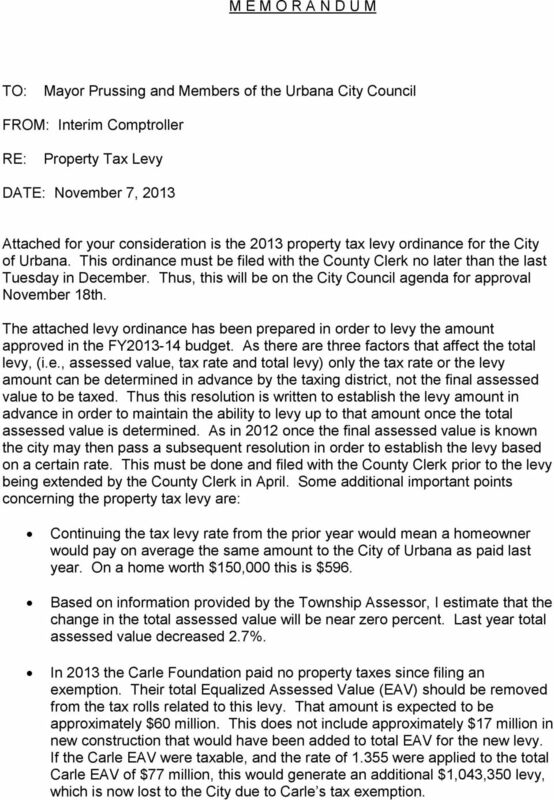 Some additional important points concerning the property tax levy are: Continuing the tax levy rate from the prior year would mean a homeowner would pay on average the same amount to the City of Urbana as paid last year. On a home worth $150,000 this is $596. Based on information provided by the Township Assessor, I estimate that the change in the total assessed value will be near zero percent. Last year total assessed value decreased 2.7%. 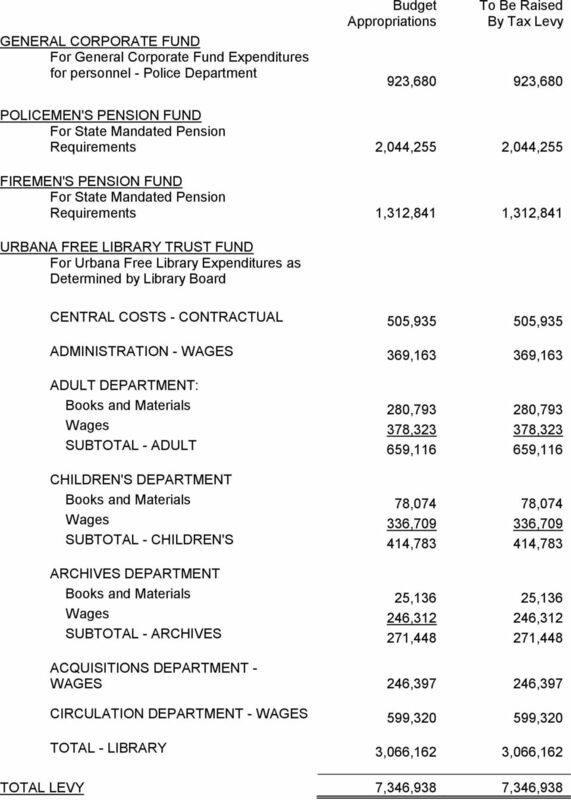 In 2013 the Carle Foundation paid no property taxes since filing an exemption. Their total Equalized Assessed Value (EAV) should be removed from the tax rolls related to this levy. That amount is expected to be approximately $60 million. This does not include approximately $17 million in new construction that would have been added to total EAV for the new levy. If the Carle EAV were taxable, and the rate of were applied to the total Carle EAV of $77 million, this would generate an additional $1,043,350 levy, which is now lost to the City due to Carle s tax exemption. 2 In 2013 TIF District 3 expired. Total EAV for this TIF is approximately $23 million. Presence is approximately $14 million of that total. If Presence files for tax exemption only $9 million of new EAV will be added to the total EAV to be taxed. 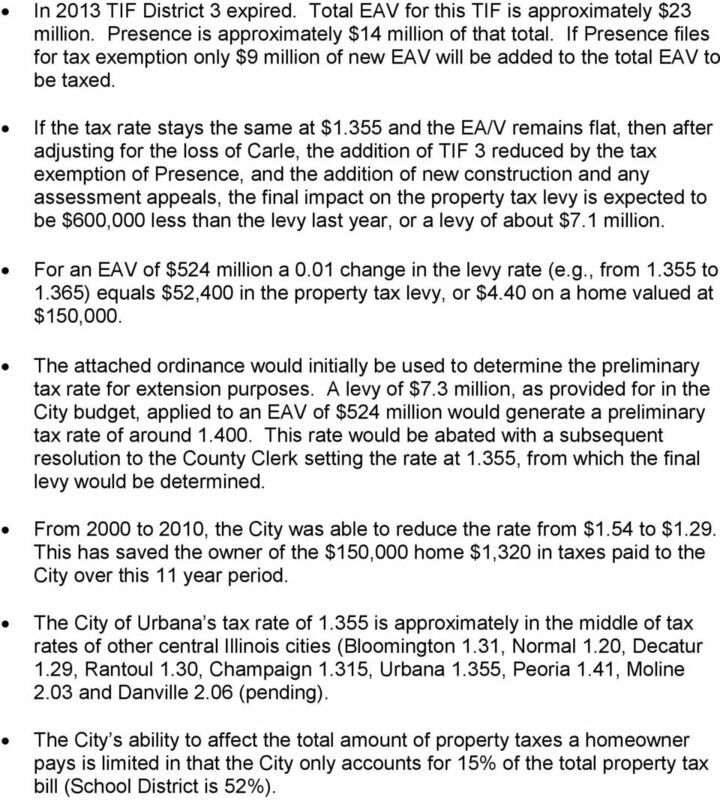 If the tax rate stays the same at $1.355 and the EA/V remains flat, then after adjusting for the loss of Carle, the addition of TIF 3 reduced by the tax exemption of Presence, and the addition of new construction and any assessment appeals, the final impact on the property tax levy is expected to be $600,000 less than the levy last year, or a levy of about $7.1 million. For an EAV of $524 million a 0.01 change in the levy rate (e.g., from to 1.365) equals $52,400 in the property tax levy, or $4.40 on a home valued at $150,000. The attached ordinance would initially be used to determine the preliminary tax rate for extension purposes. A levy of $7.3 million, as provided for in the City budget, applied to an EAV of $524 million would generate a preliminary tax rate of around This rate would be abated with a subsequent resolution to the County Clerk setting the rate at 1.355, from which the final levy would be determined. From 2000 to 2010, the City was able to reduce the rate from $1.54 to $1.29. This has saved the owner of the $150,000 home $1,320 in taxes paid to the City over this 11 year period. The City of Urbana s tax rate of is approximately in the middle of tax rates of other central Illinois cities (Bloomington 1.31, Normal 1.20, Decatur 1.29, Rantoul 1.30, Champaign 1.315, Urbana 1.355, Peoria 1.41, Moline 2.03 and Danville 2.06 (pending). The City s ability to affect the total amount of property taxes a homeowner pays is limited in that the City only accounts for 15% of the total property tax bill (School District is 52%). TOWN OF WOODSIDE. The Town Council introduced the attached draft ordinance at its regular meeting on July 28, 2015. Libraries. The local library only has to qualify under one of the two tests. 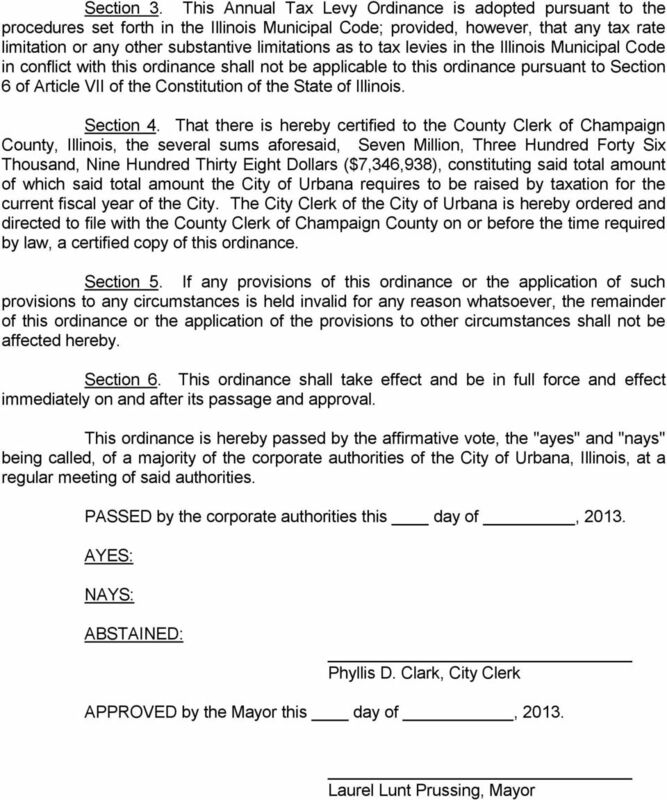 FILED CHAMPAIGN-URBANA PUBLIC HEALTH DISTRICT PROPOSED 2007 TAX LEVY ~.J;'~ CHAMPAIGN COUNTY CLERK. DEC j 3 200?